Just ordered a 2017 SUN TRACKER® PARTY BARGE® 22 DLX from Bass Pro. Never had a boat before, looking forward to spending time on it with my wife and our 4 kids! I added a ski tower to pull the kids, an extra battery, a low range GPS and a live well on the back where the swim platform is. It should be ready to be delivered in about a week. Instead of buying a trailer I am just having it delivered directly to the marina. I live in Port St Lucie, FL and the marina is in Stuart, FL about 30 minutes away. I'm sure you will have lots of fun times out there. Back into boating! Proud new (next week) owner of a 2017 Ranger 223C Reata tritoon with 150 merc 4 stroke and trailer and power pole 10' blade. Fell in love with tritoon when I rented one for mother's day. WOW, not the old pontoons I was used to running and looking forward to many sandbar weekends cruising Southwest Florida's intercoastal and maybe hit a few lakes in southwest Virginia. Will post pics after I pick it up next week. Any tips or tricks would be appreciated. 10 year warranty and Ranger brand sold me along with price compared to similar toons. I bought a 2012 Misty Harbor 16' fishing model this spring. 40 hp Honda, foot controlled trolling motor, dual electric anchors, live well, fish finder. We have a place on the Menominee river between Wisconsin the upper peninsula of Michigan. We love the small size for fishing but I have some questions which will show up in the other topic areas. Just ordered a 2018 Avalon Excalibur 27' tri-toon with a Merc400. Have had many custom boats over the years (2 Halletts, Shockwave, DCB) and this is out first toon. It was hard to make the switch, but we are looking forward to running it on Lake Havasu this spring. yikes!!!!!!!!!!!!!!!!!!! sweet toon! We need pics! Hubba, hubba! That gets me all tingly! '14 Harris Solstice 220, P3 tritoon, Mercury Verado 150, Enertia 14p. 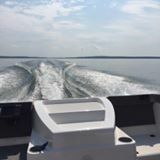 prior boat: '02 Century 2600CC, twin Yamaha EFI 200's, full instruments. I bought my first pontoon a couple of months ago. It is in storage till I pick it up. Also bought a trailer. Looking for answers as to whether I need to strap the pontoon onto the trailer, or will the weight of the pontoon itself plus being attached to the winch be enough to hold it on the trailer, while I travel. You should have tie downs on the rear of the pontoon and trailer. I recommend you use them always. I also add a tie down strap to the front of the trailer this is recommended by many to save your winch strap. Hello were new to the forums and soon to be new to pontooning but not new to boats. ordered a new tracker sportfish 22 with a 115, should be at the dealer in a month or so. already planning on transferring some of the gear off of the old boat and i guess my biggest question would be about battery placement for our 24 volt Terrova. I know they should be close together for efficiency but I just cant get over putting 2 deep cycle batteries under the seat at the front corner, I would rather spread them apart to achieve some balance. is running a set of 6awg jumpers under the floor to tie the batteries together going to be a problem. other than that were really looking forward to the new addition to the fleet. For putting the Batts in series I would run something larger than 6, I would probably use #4 or even #2. Then run your 6 from the final battery to your plug for the trolling motor. I wouldn't want any resistance between the 2 batteries your putting in series. New to this forum and new owner of Suncatcher Elite 324 SS with a Yamaha 200 . Do all our boating on Table Rock Lake, Missouri. Looking forward to sharing owner experience with everyone. Table Rock Lake, Branson West, MO.